TechCrunch reported Friday that Juul’s latest attempt at tackling the ongoing issue is with its Track & Trace program, a pilot for which the company said is currently underway in Houston. As part of the program, Juul has launched a web portal for guardians or authorities to report a vape they have confiscated from a minor using the tiny serial number that can be found on Juul devices (near the bottom where the device is charged). “JUUL Labs is committed to preventing underage use of JUUL products through technological solutions, which is why we are developing an end-to-end tracking system to better understand how our products are getting into the hands of minors,” the company’s Senior Communications Manager Ted Kwong told Gizmodo in a statement by email. TechCrunch noted that in a matter of weeks, Juul will be able to track “every device in production” through the supply chain. Kwong said the company landed on Houston for its pilot program “because we believe that as a large metropolitan area it will provide us with sufficient information to assess the program and create a blueprint for expansion.” But anyone—including those outside of Texas—can report a confiscated Juul with its product ID through the web portal. Kwong said that once the company receives that information, it will work to identify the sale source. 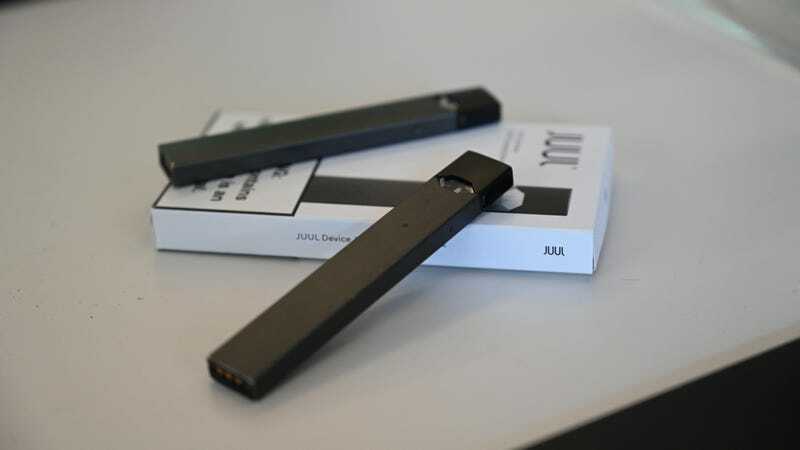 According to TechCrunch, the company’s systems for handling investigations involving the sale or distribution of Juul products to minors could involve secret shoppers—Juul has active undercover shopper programs in both Canada and the U.S.—or speaking directly with the management of a retailer suspected of engaging in the illegal sales. Juul has faced increased pressure from the FDA—and particularly the now-former Commissioner Scott Gottlieb—to use a more aggressive approach to keeping its products out of the hands of kids as youth vaping numbers continue to rise. This is particularly true following Juul’s controversial deal with Big Tobacco last year. Faced with potential regulatory action, Juul has been actively working to execute on a number of initiatives to curb the use of its products among minors, including with an expanded secret shopper program, axed social media accounts, age verification technology and purchase restrictions on its website, as well as numerous other efforts. Still, Gottlieb spent much of his remaining time with the FDA publicly castigating Juul for its role in an ongoing “epidemic” of youth vaping and suggesting that Juul and other e-cigarettes could face being pulled from the market if the trend continues.